Doesn’t do what it says and crashes. Waste of money! I paid for this app and it shuts down every single time I select the song I want to make a ringtone out of!!!! Tried multiple times over the last 3 weeks and same thing happens! And there is no direct way to contact the seller!!!! A dollar or not, an app you pay for shouldn’t crash. As soon as you select a song, it crashes every time. I’ve deleted, redownloaded, restarted and it’s all the same: it crashes in the same place every single time. Usually great and my go too making ringtones. But since iOS 12 the program keeps crashing as soon as I pick a song. Hope this is fixed soon. Why is it crashing before I can even begin to use this app? Waste of money. Let me do 1 ringtone and since it always crashes. Disappointed that I payed for this, may not have been much but still. Would NOT recommend to anyone! I’ve used this app to create ringtones for both my iPhone 7+ and iPhone 8+ and it worked fine, no problems. I just got my IPhoneXS Max on Friday and every time I go to make a ringtone the app crashes and closes. I’ve tried deleting and downloading again and still nothing. Considering this was a paid app I’m beyond annoyed. FIX IT ! I have figured out that it seems to work on songs purchased in iTunes or downloaded from a computer using iTunes. It does NOT work on songs downloaded using the iTunes music subscription. Otherwise, it’s a decent app. Excellent product, easy to use and little chance anyone else has the same ringtone. I am furious I paid money for this app. I created all kinds of ringtones a month back. I followed their instructions to the letter but the ringtones would not sync to my phone. I emailed the developer, which I now see was a waste of time. Save your money and find some other app. Does NOT work… constantly CRASHES!!! This is the WORST app I’ve EVER installed on my iPhone X. Crashes 100% of the time and has NEVER worked. Don’t waste your time and $$$. HORRIBLE!!! I LOVE THIS APP!!! I was a little confused about getting it synced up with my settings but I figured it out with the video!!! If I pick a song I’ve recently added from Apple Music, the song doesn’t play and the app crashes. Horrible APP Crashes When ANY song is chosen. Literally EVERY single time I go to Artist and click on a song I would like to make ringtone, it crashes and closes so it cannot be accessed! I know it was only 99 cents, but this is ridiculous.Makes me think all of these reviews are false. Downloaded App & it doesn’t work, I can’t even select a song it just closes app. Waste of money. Recording works about 50% of the time. Need to get the kinks out. The app crashes every time I open it and select a song. It only allows you to use certain songs from your library. Waste of money!! I’m using iOS 11.2.1 and it does not work at all. Just keep getting error messages. Says it’s compatible with iPhone X. No go for me. 0 stars if I could rate it that. I bought this in hopes to be able to create my own ringtones but half the songs on my iTunes won’t work in this app. It should be stated that not all song work! I’ve reinstalled the app restarted my phone but every time I select a song to edit it crashes the app. Whenever I attempt to load a song that is on the latter half of the alphabet the application will crash on me 100% of the time. Awesome and easy to use!! This is by far the best ringtone maker I've ever used . All the right one I create with this app; will not transfer to the phone any longer. There is no support; not a single response to the only email address to contact the makers. Purchased this app hoping it would be great! It’s a dud! I open it up pick a song and it crashes! Crashes!! WTH! Every time I click on a song it goes back to the home screen. Can this fixed? Super easy! I wish the waves were more detailed. It used to perform wonderfully. Now it just crashes when I choose a song. I removed the app then reinstalled and still no luck. I won’t my money back! I watched the video and I am following the steps. Still no ringtone! It appears this app only work on old songs. If you select any new song to play as review, there will be no sound and just do nothing. If you select to open any new song, the app will crash and shut down. Love it. However, could use better precision when selecting the area to use as the ringtone. Right now I can not get any of my ring tones to download to my Phone. Not working ! Waste of money. Bought the app because of the good reviews, and it was a waste of MONEY. It doesn’t even work for my iPhone X like it said it would. It won’t even play my songs when you select the song, and when i selected a song it won’t even play when you try making a ringtone. Kept giving me an error message. DON’T WASTE YOUR TIME. I don’t see how it has this many good reviews. The text tone music should be longer. 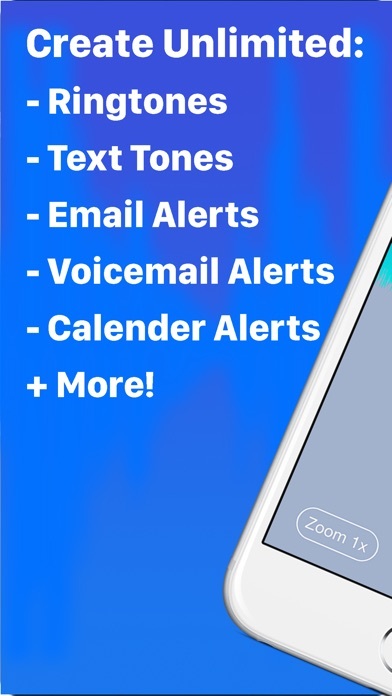 I purchased this app for my iPhone 6 and after learning how to make the ring tones it worked great to the point of getting the tones moved into my phone. I went through the YouTube video step by step multiple times before reaching a frustration point the led me to try to contact support. To date (2 weeks later) I have received nothing from the developers of this app. I do realize apparently others have had good success with the app and possibly I am misunderstanding something in the functionality of the transfer process but that doesn’t excuse the fact that their “support” is nonexistent! I’m about as disgusted as I can be with these people and would not recommend wasting money on this app! I paid for the upgraded 2.0 and don’t load any of my song after allowing to access my music playlists! Good job on this app But. It would be an AWESOME app if you could add to Ringtones directly from the app to your phone instead of having to hook it up to the computer/iTunes Library sharing. Definitely a five-star if they were able to do that, to me at least!!! I’m having an issue deleting the ringtones off my iPhone that I made with this app . I’ve deleted them off the app but they still appear on my phone . I’d appreciate help in removing them . I’ve even deleted the app and after syncing my phone to iTunes they are still on my phone . I would have rated this a 5 the app just closes once I choose a song that I want to edit. After the update on the iPhone X, i was able to creat 2 or 3 ringtones but no it just shuts down. Anything I need to do to fix this? I already tried re-installing the app. When you open the app there is no way to go to the instructions if you created a ring tone but then had to exit the app before you could follow instructions. There should be a help link. Easy to use- great variety of music! Love it! The fact that I payed even a penny for an app that does NOTHING it advertises, says plenty. I’m glad other people have had success with it, but the app never worked for me right from the second I downloaded it. I pick a song, and if it doesn’t crash as soon as I press it, it doesn’t let me preview the selection or even save it, not that I’d even know what I’m saving since you can’t listen to it. Ridiculous. Don’t charge for something that doesn’t work. Period. Bought this app thinking it’d be different but it’s not. I basically just gave this person my money. The tones do NOT transfer back into iTunes sync section. I’ve tried everything and nothing works. Do not buy this app. Your money will get stolen. I wish I could write something insightful like easy to use or the background should be a different color but simply put, it doesn’t work, period. At least not on an iPhone 7 with IOS 12.1. First screen says “Get Started”, then it says “Select Music” and it won’t do anything after that. Just an infinite spinning clock. Developer offers no support. Sadly, I wish saying it was only a buck would make it OK. Pathetic, both developer and Apple. 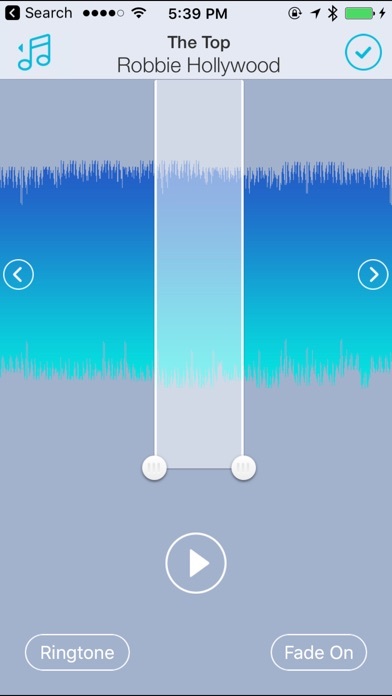 This is the easiest app I have found to make ringtones. Works right every-time. And I hate technology. I just paid for this dang app and every time I click on a song to use the app closes. what the heck people. This app was super easy for any songs your own, or willing to buy. 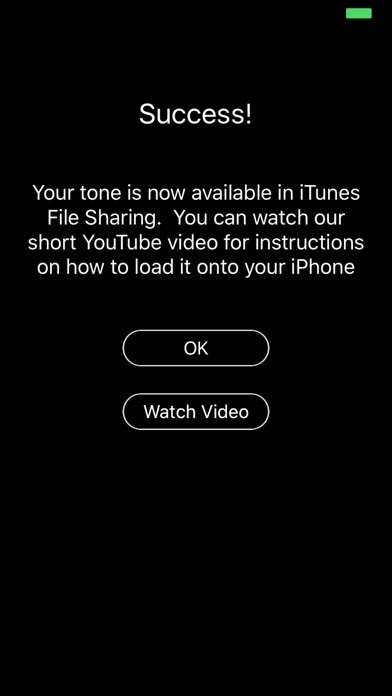 I do wish you could make the text tone a little shorter. I like my text tones very short. Didn’t work. App shut down randomly. Perfect absolutely perfect havent had an issue yet.. This s app does not work at all! I have not been able to create ringtones do to no sound and errors if I try to complete it anyway! Definitely do not recommend! This app would get 5 stars, however since the last iPhone update, it consistently crashes? What happen? Please fix this as it’s the only one that truly works with iTunes music library. This app is worthless in practically every way. The design takes you back at least five generations of iOS versions. It can only see crappy iTunes music libraries (versus leveraging other music sources such as Dropbox, iCloud, etc). It’s solution to enabling you to create a ringtone and use it is to send you to a YouTube video to do it yourself. It’s editing controls and interface are weak and limited. On top of it all, it’s buggy; it crashed on me nearly every time I tried to record something. Save yourself the 0.99 cents and use the built in voice recorder and Garage Band apps for an overall DIY better experience. Instead of giving these weak sauce developers the 0.99, throw it in a fountain and make a wish - I guarantee you’ll get more value from it than this pathetic app. This app will not run on my iPhone X running iOS 11.2. I am able to load songs, but pressing the play button does nothing, and pressing the “use selection as ringtone” button brings up an error message. Even the technologically challenged can manage this. Love it. How about without a computer? I want to be able to make and use this app w/o connecting to my laptop. 5 stars would mean it has a search bar. But it is still Pretty great! The app doesn’t allow me to download the music clip. It says “Error The operation could not be completed” please help. Works like it should; text & ringtones. Definitive start and stop points, accurate. App is very easy to use. Apple playing games with new revisions. Very easy to create ring tones! Love it because I can make custom tones from any section of the songs I want! I have used the free and now the paid app for several years. Lots of success until the most recent few months. It keeps crashing on me all the time. I have deleted it and reinstalled it to no avail. Prior to several months ago o have given this 4/5 stars. Oh, and can’t get any response from their “customer service” email. Thanks for the rip off..
From the moment I downloaded the app, I select a downloaded song from my iTunes library and I click the song and the application closes itself every time. It doesn’t work whatsoever. Download it if you wanna waste your money, or just go buy a happy hour beer. I have used the free and now the paid app for several years. Lots of success u til the most recent few months. It keeps crashing in me. I love how I can customize the ringtones with my favorite songs! For some reason I can't create my ringtone, it won't let me preview what I selected. It also says an "Error. The operation could not be completed." What happened? Why is the length short now? I bought the Unlimited version & you can make the ringtone as long as you want, now it’s so short. I like how you can now stop a tone in the middle instead of having to wait through the whole thing, but I wish there was a way to start half way through instead of waiting the whole bit. Still really good app though. After downloading the latest update which supposedly was for iPhone X, the app crashes as soon as you click on any song. I would like to be able to rename my selection of text tones, rather than having "recording 1", "recording 2" Otherwise, fine app. Brian J.
App closes as soon as I click the song I want to make ringtone for. The best ringtone maker I have had it for a couple of years it’s easy to use. I’m new to this ringtone thing, and this is the first app I got so I don’t know if my complaints are actually legitimate. You decide. It made making a ringtone quick and super easy and was good about telling you how to get it on your phone, but there were some features that would have made it even easier. I wish... ** You could search for a song, artist or album instead of scrolling, and scrolling, and scrolling, hoping you remember the title correctly. ** You could ‘lock’ start/end points. You have your sound wave with arrows on the side to move it a little, or you can drag it to move it a lot. You have the white section where you are selecting your ringtone and you move the bars to select start and stop. Unfortunately, there is no way to move them TOGETHER. Say you have the start point perfect, but then you discover the end point you want is off the ‘page’. When you move the wave, the selection stays still so you lose your perfect start point. If there is a way to ‘lock’ it, I didn’t see it. ** You could pick the point you start playback when editing. I recommend starting with your end point because to get to the end, you have to listen your ringtone from the start point... every time. So if you have the start perfect but still need to nail the end - you will listen to the WHOLE tone, EVERY TIME, to check each attempt. You can’t start in the middle or play just the last second or two. ** You could get more precise. You only have the start/stop bars. It is pretty easy to move them and get really close to any point you might want, but it would be nice to be able to go in and tweak the .x numbers to get it precise, or maybe ‘zoom’ in to position more precisely’, but I didn’t see anything like that either. (I also wish it could make a 1 second text tone [app minimum is 1.8]) Overall, the fact that it was SO super simple was a hindrance to my ‘tweak it til it’s perfect’ mind set, but if your primary qualification for a ringtone app is fast and super simple with decent results, this app will meet your needs. I can’t seem to get my song uploaded to my iPhone from the app, even though I am following the instructions. I just downloaded this and it crashes immediately when I chose a song. I want my money back! Too easy! Great ringtone maker! Been using this since the developer created it. Very simple app. 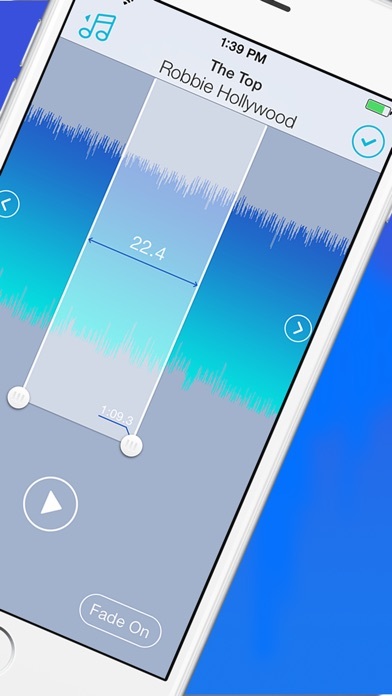 This is the best ringtone maker. The developer needs to make it so you don’t have to use iTunes to add it to your ringtones. Doesn’t work with Apple Music service. This app does not work with Apple Music service. You must own all downloaded music for it to work. I just purchased this app based on other reviews. Every time I select a song, it crashes. Please fix for iPhone 7 Plus. Unless you buy all your music or illegally download it all, don’t purchase this app. Sadly, it doesn’t even say that this does not work with Apple Music, Apple’s premium music service. It works otherwise great. This app was great... emphasis on was. Now, as soon as I select a song from my apply music (downloaded), the app instantly crashes. 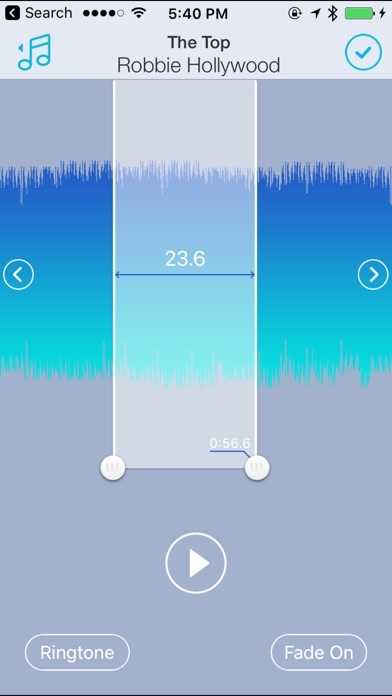 I really like this ringtone maker, because you don’t have to jump through hoops just to make a Ringtones for your phone! I bought this because of the reviews. It is very easy to make ringtones from music library, but they don’t work on my iPhone. I HAVE watched the video, followed the instructions and no tones showing up on my phone. In addition, my other ringtones disappeared. Totally useless and I wasted money. Simple to use and iPhone X support.